This was something I was excited about as soon as I first heard about it! My home town of Congleton, Cheshire had its own local radio station! It was something for the entire community to get interested in/involved with…and it was a chance to further promote myself and my writing. When The Saviour was published back in 2011 – and I was promoting it as much as I could – I reached out to various radio stations in the local community to try and get on to the show to discuss my work. Sadly, not one of them showed any interest. 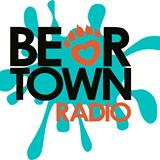 I sent out word to Beartown Radio, hoping they would be willing to have me on one of their shows. Thanks to help from one of my friends, and Beartown Radio being so supportive and enthusiastic towards Congleton’s own community, events and people, I got a guest slot onto Mark Potts’ ‘Mid-Morning-Madness’! Needless to say, I LOVED the whole experience and Mark was simply great to speak to. He was friendly, enthusiastic and a real professional on-air. We had a great discussion on-air about not just my writing, but all-sorts of great things. Above all else, Mark made me feel so at-ease during a live broadcast. We had a real fun chat and I came away feeling so positive. Mark had done me a huge favour. As a result, we became friends and i developed such a taste for radio. A month after that interview, I approached the head of Beartown Radio, Keith Graham, about the possibility of me presenting a radio show for the station. Keith liked my ideas, and came up with the plan of pairing me up with Beckie Morley, for a two-hour arts show on Tuesday nights called ‘Curtain Call’. Shortly after we were first introduced, Beckie and I started meeting regularly to discuss the content for this new show. Aside from being a wonderful person, Beckie has a really creative mind, and real passion for whatever project/work she’s involved in. Between us, we came up with a great format – music, poems, songs, various features like ‘Review of the Week’, and the ‘Creative Spotlight’, a slot at the end for my Bear Spirit serial – and we made the purpose of our arts show to not only focus on television, music, books, theatre, literature, cinema and current goings-on in the UK…but also in our own town of Congleton. Beckie and I had great chemistry right from the get-go. We were both nervous for our first show, but we were thrilled by the number of people who tuned-in to listen to a show that WE had devised and presented live for two-hours! Following that, we continued with great success and consistent ratings week-after-week. We covered events at the local theatre, interviewed independent/aspiring talent and real-life celebrities, discussed news, promoted local events, played all manner of music and features that we wanted to…and it was a BLAST. The format was such good fun, and people loved it as much as we did. Beckie was an absolute joy to work with and I’ll forever be proud to have worked alongside her. Curtain Call lasted approximately six months. Beckie’s work-commitments and studies sadly meant she had to call it a day on the show. Keith asked me what I wanted to, and I chose to start anew. Curtain Call worked so well because it was me and her, and I knew I couldn’t carry on a two-hour arts show by myself. Aside from it being too much for one person to organize week-after-week, the format needed two personalities to feed off one-another. So after going back to the drawing-board, I came up with The Box of Stuff and a week after the final edition of Curtain Call had broadcast, I was back on-air! The idea of The Box of Stuff was that ‘you never know what you’re gonna find everytime you open the box!’. Every week, the show took on a different theme. The malleability of the show was something I could really sink my teeth into, and cater towards different audiences. One week, it could be about playing songs and clips from BBC’s ‘The Young Ones’, another week it could helping to celebrate Doctor Who’s 50th Anniversary, discussing real-life situations like learning to drive, having independent talents on the show to be interviewed, covering local events, paying tribute to the fallen heroes of World War One…I even organized a live radio quiz! It was an hourly show, so it didn’t outstay its welcome, and the ever-changing format kept it fresh and versatile. I loved the positive feedback, I loved meeting so many talented & friendly people, listening to all-manner of great shows on a daily basis, helping to promote talent and doing something worthwhile. And I didn’t want it to end. Sadly, it was due to circumstances beyond our control. 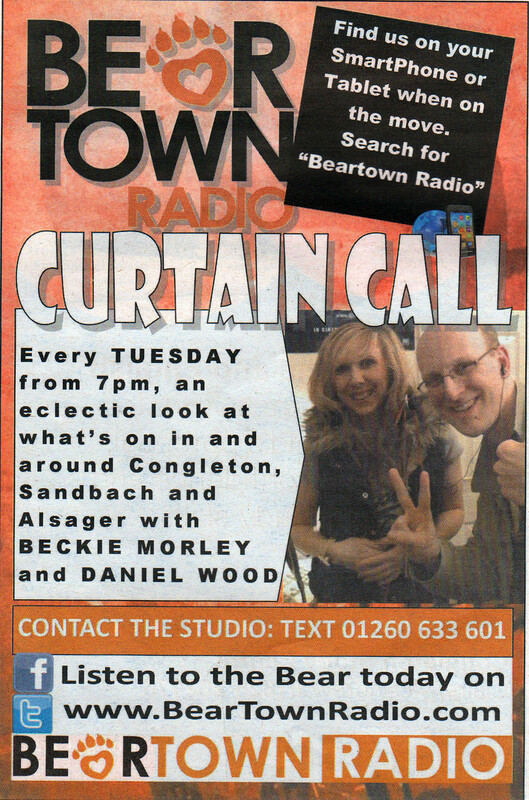 On the 15th January 2015 – TWO DAYS after my first show of the year – Beartown Radio broadcast for the final time. We were all devastated…something that we had all put so much time and love into had been taken away from us without notice. But one good thing that came out of all that…was the overwhelming support. All our listeners, all those who had guest-appeared, and/or been involved with the station gave all the presenters and Keith Graham gave their appreciation for all our hard work, and their condolences over Beartown Radio’s closure. The people of Congleton, Sandbach, Alsager and from wherever else in the world they listened from…genuinely cared and would miss our shows. All our efforts hadn’t been for nothing. And that meant a LOT. 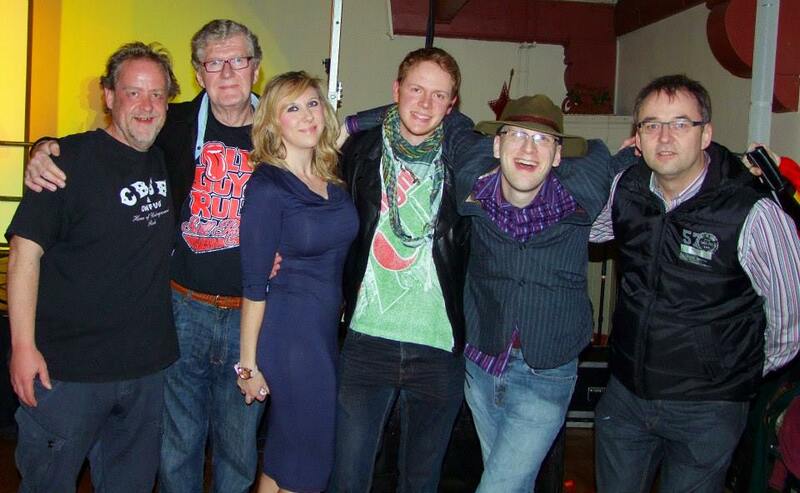 I still keep in touch with all the great friends I’ve made during my time at Beartown Radio. I had so many great times, did a lot of worthwhile things, and I wouldn’t trade any of that for anything. So THANK YOU to Keith, Mark, Beckie, John, Tashii, Michael, Harvey, Hollie, Richard, Paul, Simon and everyone else who worked at Beartown Radio. You’re all amazing and so talented. All the best for the future, guys! Would I like to go back to radio? Course I would! But for now…The Saviour & Hi-Jax needs to be finished. And there are other plans that need to come to fruition.